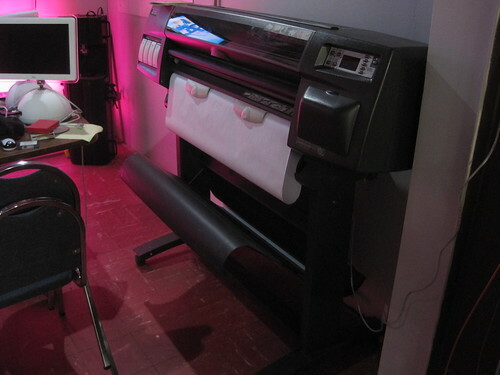 Thanks to a kind donation, the lab received a dead HP DesignJet plotter. It's beautiful. Thanks to some advice from Ken M., we were able to troubleshoot a power supply issue, which seems to have been the primary cause of failure. It appears to be running fine with the exception of a crash or two while paging through the menu-driven interface. Now that it is working, it looks like the plotter will be added to the list of available resources for the lab. The cost of supplies is a bit higher than standard laser printing, so we will work out a per-page change jar for the future to help cover the cost of replacement heads and ink (which can run $500+!). Even with a high maintenance cost, the plotter is worth it: A laser printer can't print full color on E-size (36" wide) CAD paper! Much thanks to L.B. for the donation! Additionally, thanks to Beau for transport assistance and Leeroy for troubleshooting assistance! 757 Labs: Hampton Roads’ Hackerspace and “YMCA for the Mind” | AltDaily : Creating and celebrating local culture in Norfolk and all of Hampton Roads.